tert-butyl substituents crowd each other but at the same time it is predicted to be stable. Novel research from Du Pont researchers only indirectly aimed at this particular target is probing some properties of a related crowded alkene with just two t-Bu groups and one carboxylic acid group (DOI). Although this concerns 2008 chemistry, given the inventory of chemical reagents, the reactions presented may as well have been performed in 1908. 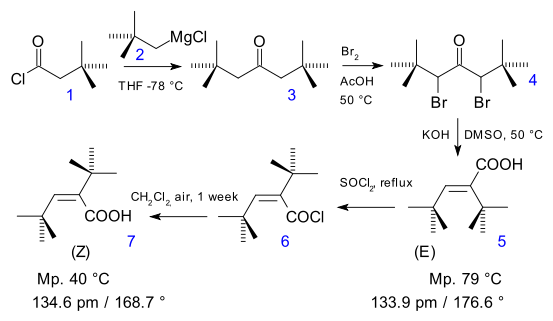 Step one is a Grignard reaction, joining acid chloride (1) and Grignard (2) to form the dineopentyl ketone (3). This compound is brominated to 4 and reacted to strained (E) - 5 with potassium hydroxide and DMSO in a Favorskii rearrangement. What happens next is interesting: for no particular reason the Du Pont researchers add thionyl chloride in order to convert (5) into the acid chloride (possibly to fit the molecule with a nice ester tail and then polymerize it) which works just fine but an unexpected cis-trans isomerisation yields the (Z)-isomer (the authors suspect involvement of hydrochloric acid). The final reaction step to the (Z)-carboxylic acid by hydrolysis from ambient air and subsequent crystallization while dissolved in methylene chloride is either an carefully planned reaction protocol or the researchers initially discarded the acid chloride as a failed project. In any event the final outcome allows an interesting direct comparison between two hindered alkene isomers. Both alkenes are reported to have have shortened carbon-carbon bonds and experience some serious torsional strain.